MONCTON - Acadians in the Maritimes (Canada) lost one of their best-known and best-loved leader: Father Leger Comeau, a former President of the Acadian National Society and a member of the Order of Canada, in Baie-Ste-Marie, Nova Scotia. He was on his way to give an interview to a community radio station and was found in a stairwell. He was 76. "He was a great man, a visionary," said Liane Roy, the Society's current President. "He had a lot of dream and he wanted to see the Acadian community grow and develop." Father Comeau was the first Acadian to be made a Knight of the Legion of Honor, France's highest civilian recognition. He received it from then-president François Mitterrand in 1988. He was also a Vice-President of Université Ste-Anne, a francophone university in Nova Scotia. 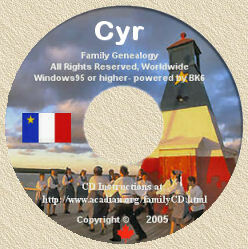 In 1988 the Acadian National Society named a medal after him. Ms. Roy last saw Father Comeau in October, during a trip to France to commemorate the 20th anniversary of a similar voyage that established links between France and Acadie. She said the priest served, not only Nova Scotia Acadians, but his compatriots throughout Atlantic Canada. "We lost and society in general, lost a very wise and very great man," she said. "He fulfilled his mission." Born in 1920 in Saulnierville Nova Scotia, Father Comeau taught at two schools in northern New Brunswick during his early years: College St-Louis in Edmundston in 1950-51 and College de Bathurst from 1952 to 1958. In 1967, he was the founding President of the Fédération Acadienne de la Nouvelle-Écosse. He held the position a second time, starting in 1978. The same year, he became head of the Acadian National Society, an organization comprised of Acadian organizations in several provinces, and held the post for 10 years. Jean-Bernard Robichaud, the President of the Université de Moncton, which gave Father Comeau an honorary degree in 1990, said "Acadie has lost a great nationalist and one of the most illustrious ambassadors." Author of 'La Sagouine', Antonine Maillet, said the priest was the dominant figure in Nova Scotia's Acadian life and that he had paved the way for that community to take its rightful place in modern Acadian society. Reproduced, with thanks, from The East Coast Connection (Volume 3/Number 2).